10:00 am - 12 Noon - New Lenox CROSSWALK (A moving and “moving” service for Good Friday beginning at St. Jude’s Catholic Church, then United Methodist Church of New Lenox, then Maplewood Cemetery, past Grace Episcopal and concluding at Trinity Lutheran Church. 6:00 pm - THE GREAT VIGIL OF EASTER - This is a wonderful service which is the first service of Easter. It is Not an all-nighter because of the name “Vigil” as many people fear - it is about an hour long, beginning in darkness as if we are in the tomb; we light the new fire of Easter, hear readings about God’s saving acts, kick on the lights and the music and sing “Alleluias” as we celebrate the first Eucharist of Easter. Please consider making this service a part of your Holy Week experience if you can and if you never have before!! Following the Evening Service: Champagne Reception in the Parish Hall! 11:00 am FESTIVE EUCHARIST RITE II (with Music). *Incense will be used at this service only. Easter Egg Hunt @ 12 Noon! EASTER BRUNCH @ 12:15 pm - Join us for a huge array of wonderful foods baked and prepared by the members of Grace - you won’t want to miss this! The season of Lent concludes with the dramatic and moving series of worship services known as Holy Week. The week begins with Palm Sunday, on Sunday April 14th, where we recall the triumphant entry of Jesus into Jerusalem; and at the same time, we remember our roles in the Passion - Jesus’s final hours from his arrest, to his trial, to his crucifixion. On Maundy Thursday, we remember the “mandatum” (commandment) to serve others, embodied in the footwashing of the disciples from John’s Gospel. This also commemorates the Last Supper. Next is Good Friday, noteworthy for its absence - no communion (Eucharist), a stripped-bare altar, and ample time for silence and reflection. The final three days of Holy Week, the Triduum, conclude with the powerful Great Vigil of Easter on Saturday the 20th at 6pm, where we begin in darkness, light the new fire of Easter, remember God’s saving acts in humanity, and culminates in the first Eucharist of Easter. 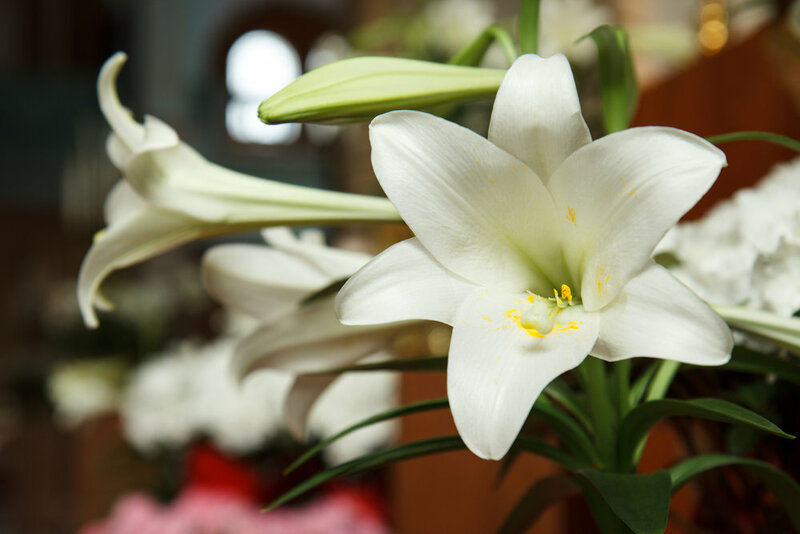 Easter Day on Sunday the 21st is pure, joyous celebration: the Feast of the Resurrection.